Cycling is a great, low-impact way to stay fit, but it isn’t without risk of pain and injury. Most cycling pain occurs due to poor bike fit or improper riding technique. It’s important to have your bike adjusted to your body because proper bike fit can prevent pain and injury. Your upper body is at risk of injuries in falls from your bike. But you also may have overuse injuries. Concussion and Head Injury: A concussion is typically caused by a severe head trauma where the brain moves violently within the skull. It can happen in a fall. Wearing a bike helmet is recommended to reduce the risk of a serious head injury while biking. It is also important to recognize and treat the early warning signs of an injury. Clavicle Fracture (Broken Collarbone): A shoulder fracture typically refers to a total or partial break to either the clavicle (collarbone) or the neck of the humerus (arm bone). It generally is from an impact injury, such as a fall from your bike. Hand Numbness (Ulnar Neuropathy) and Wrist Pain: This pain and numbness of the small and ring finger are associated with pressure on the handlebars for long periods of time. Carpal tunnel syndrome can also occur. Always ride with your elbows slightly bent to act as a shock absorber. Alternate the pressure on the inside and the outside of the palm while riding. There are some specific problems with the lower body related to cycling. Pudendal Neuropathy: This chronic pelvic pain happens from sitting in the saddle too long. Regular rest breaks and time off from cycling may be needed to reduce the risk. Changing the type of seat has not been found to be effective. 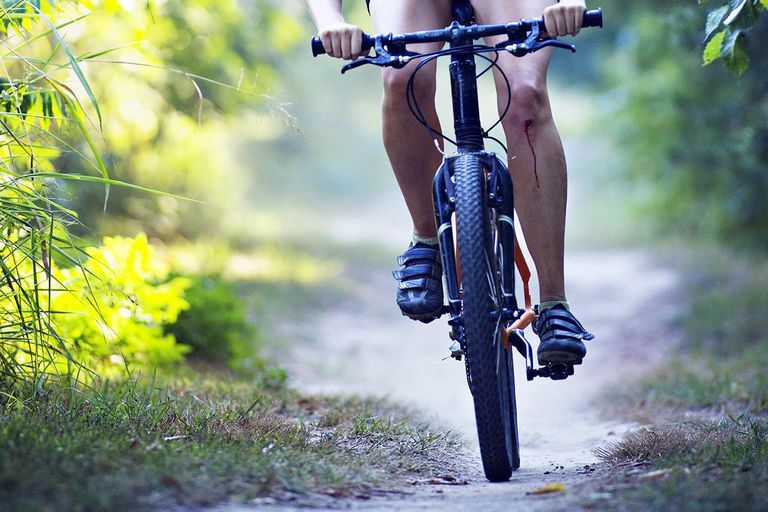 Knee pain is extremely common in cyclists. In order to treat the cause of the pain, it is important to have an evaluation and proper diagnosis. Shoe modifications and changing your cleat position may help. Common reasons for knee pain in athletes include the following. Patellofemoral Pain Syndrome: This term usually refers to pain under and around the kneecap It is also called runner's knee. Chondromalacia: This term refers to softening and deterioration of the underside of the kneecap. In young athletes, this is typically an injury from trauma, overuse, poor alignment of the knee joint, or muscle imbalance. This leads to friction and rubbing under the kneecap the results damage to the surface of the cartilage. The sensation is a dull pain around or under the kneecap that worsens when walking down stairs or hills, climbing stairs, other weight-bearing activity. Osteoarthritis of the Knee: Osteoarthritis is the most common type of arthritis in athletes. It is a degenerative disease that results in a gradual wearing away of joint cartilage. Typical symptoms of osteoarthritis are pain, swelling, and a decrease in the range of motion of the knee. Morning stiffness that decreases with motion is also common. Iliotibial Band Syndrome: IT band friction syndrome often results in knee pain that is generally felt on the outside (lateral) aspect of the knee or lower. These injuries are primarily due to overuse. Achilles Tendonitis: Achilles tendonitis is a chronic overuse injury of the tendon in the back of the ankle. It tends to come on gradually over time until the pain is constant and exercise or activity too painful to continue. Left untreated, Achilles tendonitis can lead to an increased risk of Achilles tendon rupture. Plantar Fasciitis: Plantar fasciitis is the most common cause of pain on the bottom of the heel and usually defined by pain during the first steps of the morning. Arch Pain: Arch pain or strain can be due to inflammation, with a burning sensation under the arch of the foot. Treatment of arch pain often consists of adaptive footwear and inserts. Blisters: Blisters are fluid-filled sacs on the surface of the skin that commonly occurs on the hands or the feet due to friction. Your shoe may be rubbing your foot in the wrong place or your grip on the handlebars is causing this friction. Cyclists are also at risk for these common aches, pains, and injuries. Abrasions and Road Rash: Falling from your bike onto a hard surface can scrape away layers of skin. Muscle Cramps: A cramp is a sudden, tight and intense pain caused by a muscle locked in spasm. Factors that may contribute are dehydration, electrolyte depletion, muscle fatigue, and doing a new activity. Sprains and Strains: These are acute injuries that vary in severity but usually result in pain, swelling, bruising, and loss of the ability to move and use the joint. Delayed-Onset Muscle Soreness: This is muscle pain, stiffness or soreness that occurs 24 to 48 hours after unaccustomed or particularly intense exercise. Overtraining Syndrome: Overtraining syndrome frequently occurs in athletes who are training for competition or a specific event and train beyond the body's ability to recover. Sennett B. Preventing Cycling Injuries. American Orthopaedic Society for Sports Medicine. Why Do I Feel Knee Pain When Running?